There have been a number of articles on CBC.ca lately about electric cars and the high price of gasoline. I’ve posted a few comments to these articles (and a few people have replied to my comments) but it’s a bit hard to find your musings on CBC.ca‘s web site so I’ve gathered my comments together here. Consumer demand drives the price at the pump, not some yahoos with a grenade launcher, or speculators, or oil companies, or governments. If you want to save money on gas, buy less! If If you want to live 20km from where you work then pay the price – I do, and I cut my travel time by 2hr vs. public transit and save a ton of money on extra daycare charges! Oh wait, did anyone catch that? It’s all inter-connected. The cause of pump prices is obvious, but the solution is way more complicated. And now the farmers that are producing crops for ethanol to “green” our gas are driving up the price of food that used to be made with their crops! Someone wins so someone loses!!! 1) Even though it’s built in Quebec you can’t buy it in Quebec! And for the price of one ZEN I could buy TWO fuel efficient sub-compacts that are available in Qc, are highway rated, and have room for my daughter (but maybe not Rick Mercer’s 20 cases of beer, only 10). To JoshERTW: Have you actually looked at the ZENN car’s web site? They’re NOT highway certified (40km/h max speed) so most people (including myself who lives in suburbs) couldn’t even go to the grocery store (not without tripling my drive time); there’s no backseat so where do I put my daughter’s car seat? And they cost over $20,000 – twice the price of a sub-compact that has a backseat and can go on the highway! Plus the web site is written totally in Flash – sheesh, talk about abusive wastes!!! Sorry, but any vehicle that cannot go on the highway is going to have very limited appeal. I live on the island of Montreal, but even for me to get around in my own town I take the highway – technically it’s avoidable but not without long detours. Also, the these cars have no backseat so no where to put my daughter – i.e. : families won’t buy them. And a fuel-efficient sub-compact is almost half the price of an electric car (and it can go on the highway and it has a backseat). Furthermore, it may be cheaper after 5 years to replace the batteries but I bet most people will have an easier time putting $20 of gas into the tank when it runs low rather than saving up for a new battery! And I have a second comment on the last article that hasn’t appeared yet so I’ll update this post once it does. 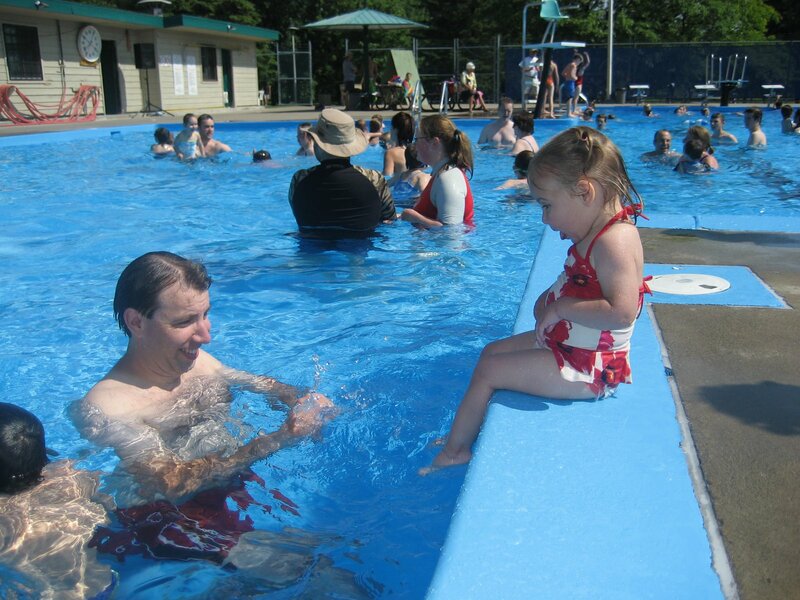 After a successful fishing trip and a delicious brunch in Rigaud for Father’s Day we went to Valois Pool for the first time this summer! It was the second day the pool was open and it was packed! Lindsay loved swimming around and sitting on the edge kicking and splashing me!